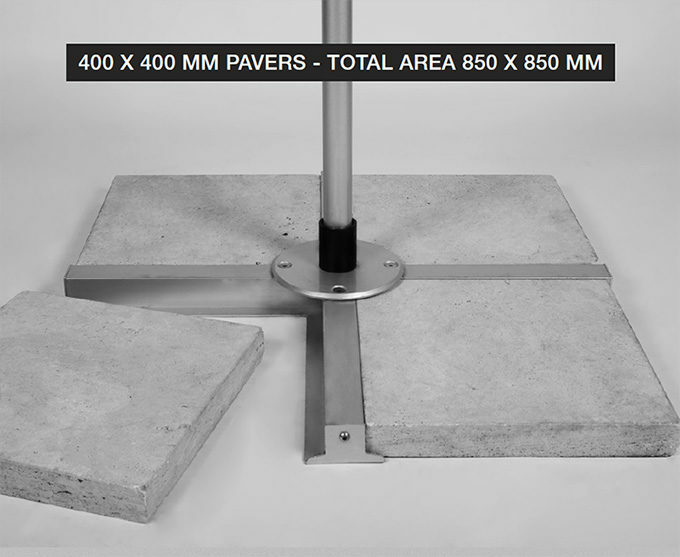 The Finbrella Movable Bases are designed to be used with readily available standard size paver tiles – concrete or stone type. The pavers should be between 50 mm and 60 mm thick. Finbrella does not normally supply ballast pavers. This allows you to select from a far broader range than Finbrella could offer and to source far more cost effectively. Suitable size ballast pavers can be sourced from paver producers/suppliers and various garden/landscape suppliers. Marble or granite ballast tiles can also be sourced from stone and tile merchants. 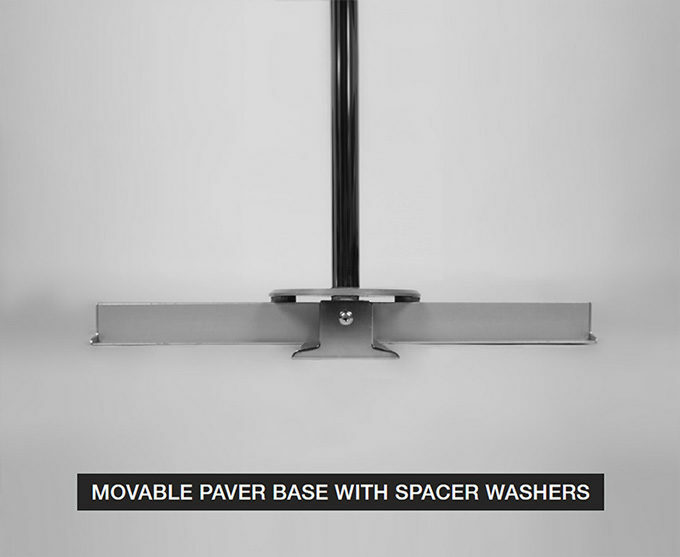 The Movable Paver Base is very simply assembled by fitting the cross members together then bolting the circular base plate of the spigot on top of them. 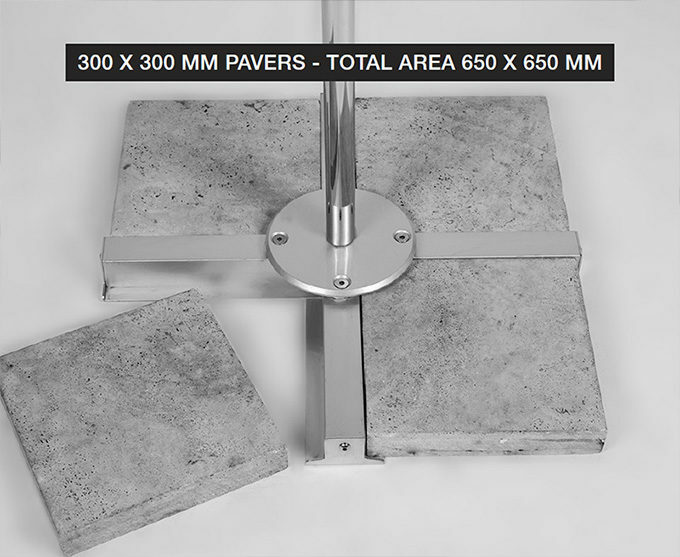 If you chose to use 60 mm thick ballast pavers then the aluminium spacer washers provided should be positioned between the base plate and the cross members’ fixing holes. 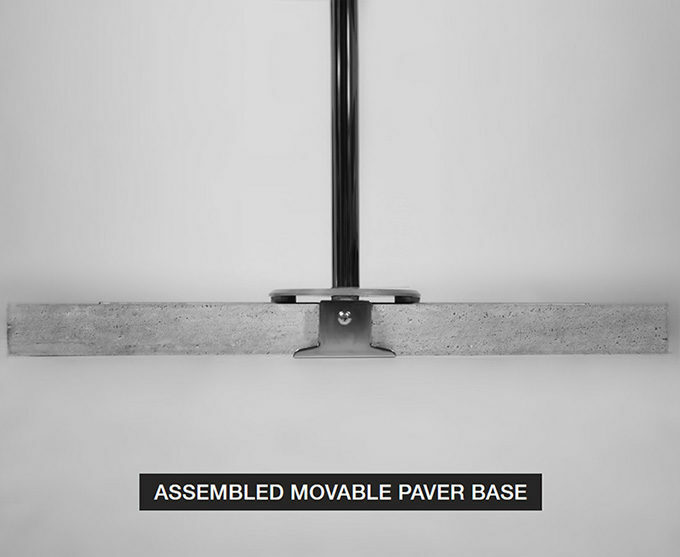 Important: The Finbrella Movable Paver Base should be positioned on level ground so that the base spigot is vertical. Effective wind resistance is achieved with the centre pole at right angles to revailing winds. These base weight minima will provide stable anchoring of the Finbrella in winds up to 35 kph, however it is essential to remember that wind speeds and direction can be fickle. WARNING: It is the user’s sole responsibility to judge the force of the wind that will be resisted by the Finbrella. Wind gusts and sudden changes in wind direction are unpredictable. We strongly recommend that the Finbrella be closed where wind speeds may exceed 35 kph (20 knots). 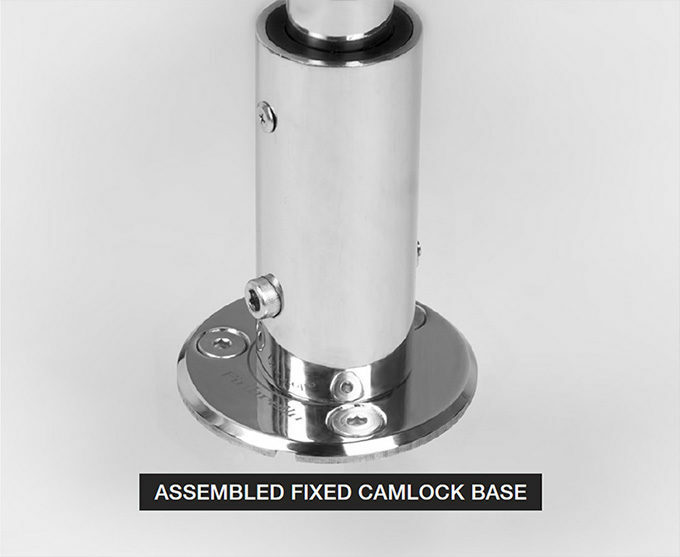 The Fixed Camlock Base can provide very strong anchoring for a variety of permanent positions. The system relies on bolting the Camlock ground plate to level and suitably robust "ground". The ground could include a concrete pavement, a timber balcony or a fibreglass boat deck. The strength and stability of the position chosen and the strength of the attachment of the ground plate to the ground is the sole responsibility of the customer. Furthermore, before installation ensure that the selected position will allow complete free rotation of the canopy (see Safety - Rotation). Do not place the Fixed Camlock Base in an exposed elevated position where wind updrafts may be directed to the underside of the canopy. Three stainless sleeve bolts (10x75 mm) are provided with the Camlock ground plate. These are only suitable for fixing to masonry ground. The accompanying countersunk barrel nuts may serve in conjunction with appropriate 8 mm stainless bolts for fixing to other types of suitable "ground". The ground plate is a low profile stainless plate and suits all Finbrella models (except the F-160 which is sand pole only). Additional ground plates can be bought separately to provide as many optional fixed positions to set up your Finbrella. Each Finbrella model has a specific size Camlock spigot. The spigot (or riser pole) is very easily fixed to and removed from the ground plate. A "tongue" extends from the bottom of the spigot and with the use of the 8 mm Allen Key (supplied), the tongue can be made to move up and down over approximately a 4 mm range. With the tongue fully extended slide the tongue into the slot of the ground plate. Ensure the spigot is centralized within the circle on the ground plate. 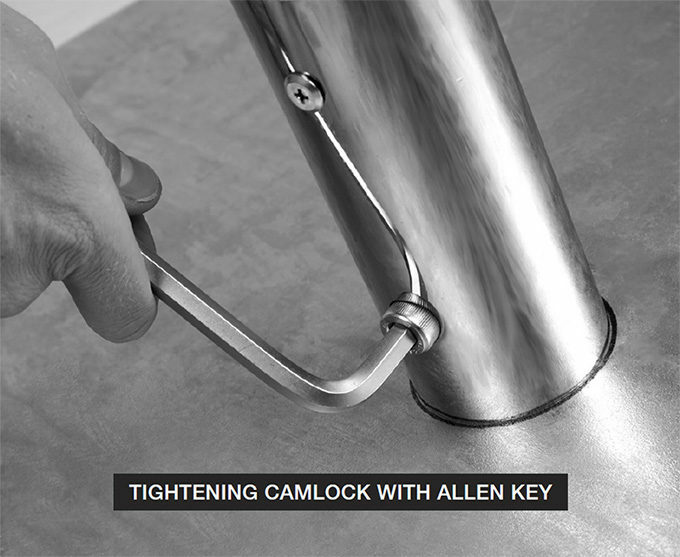 The Camlock spigot is then secured onto the ground plate with less than a half turn of the Allen key. Tighten firmly but only to hand-tightness. The upper part of your Finbrella can now be positioned over the top of the spigot. Important: The Fixed Camlock ground plate should be positioned on level ground so that the base spigot is vertical when attached. The effective wind resistance of the Finbrella is best achieved with the centre pole vertical and thereby at right angles to prevailing winds. The Movable Camlock Base is a low profile alternative to the Movable Paver Base. This quick and simple style of base has a galvanized steel plate weighing 40 kg which is suitable for all Finbrella models (except the F-160). Each Finbrella model has a specific size spigot to connect with the base plate, which is also compatible with the Camlock Fixed Base plate. When used with the F-330 and F-400 models it must be regarded as a “lightweight” base and is not recommended for use in winds exceeding 24 kph (13 knots). 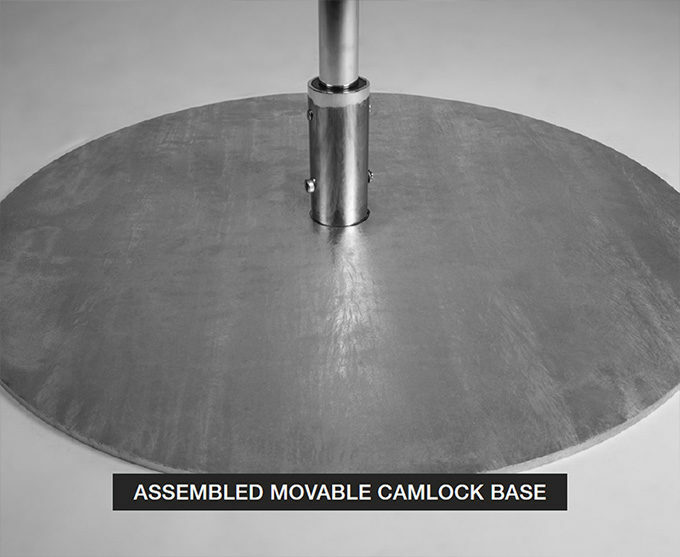 Important: The Movable Camlock base plate should be positioned on level ground so that the base spigot is vertical when attached. The effective wind resistance of the Finbrella is best achieved with the centre pole vertical and thereby at right angles to prevailing winds. WARNING: It is the user’s sole responsibility to judge the force of the wind that will be resisted by the Finbrella. Wind gusts and sudden changes in wind direction are unpredictable. We strongly recommend that the Finbrella be closed where wind speeds may exceed 35 kph (20 knots). It should also be noted that wind gusts can often be up to 50% faster than prevailing average wind speeds. Furthermore, wind force increases exponentially to wind speed (double the wind speed quadruple the wind force). Winds off-shore can often be double those measured on shore. Buildings and other topological features will further distort the actually ground level wind speeds with those reported by meteorological centres.